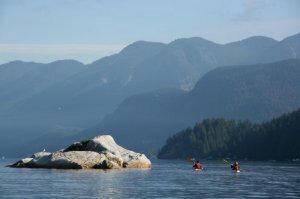 Deep Cove Kayak offers both introductory and advanced paddling lessons and has a full house of rental surfskis (and other watersports equipment. Note: Surfski Lessons are available only from May to September. These open cockpit kayaks are incredibly fast on the water and easy to learn how to paddle. This 2 hour lesson will teach you how to comfortably and confidently paddle these exciting boats. Catching a wave is often the most exhilarating feeling one gets while paddling! The Surfski is the perfect craft in which to learn to ride open ocean waves. This course is for intermediate to advanced paddlers looking for a safe, but exhilarating rough water challenge! It consists of four two hour sessions, the first three building the skills necessary towards the final day…riding waves at the Ambleside tide rip!